"The Centre for Professional Service Firms at Cass Business School is dedicated to researching the professions, professional service firms, and the professionals who work within them." A place where academics make a difference - the Centre conducts rigorous research that aims to change the way that academics and professionals analyse and understand professional service firms. A place where professionals come to think - the Centre provides professionals with space and stimulus to explore the management challenges they face. A place where academics and professionals collaborate - the Centre brings academics and professionals together to challenge each other and create new ideas. 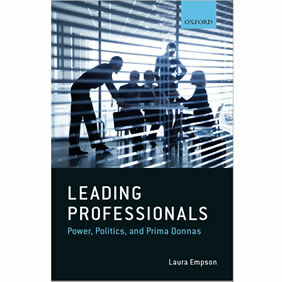 Leading Professionals: Power, Politics and Prima Donnas, published by Oxford University Press, presents more than 20 years of Laura Empson’s research into professional firms and their leaders. It analyses the complex power dynamics, interpersonal politics, individual insecurities, and organisational paradoxes that lie at the heart of leadership in professional organisations. It has already been hailed by the Financial Times as, “highly revealing and accomplished” and “a rich treasury of research and insight into how to lead professionals”. Empson demonstrates how the leaders of the world’s elite professional firms must constantly work to maintain an equilibrium which can be destabilised at any time, undermining their authority and potentially causing chaos. The book draws on the latest organisational and leadership theory to analyse in detail exactly how professionals come together to create “leadership”. It analyses how change happens within professional organisations and explains why their leaders so often fail. 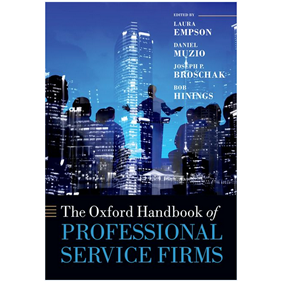 The Oxford Handbook of Professional Service Firms is a new publication edited by Laura Empson, (Director of the Cass Centre for Professional Service Firms), and colleagues Daniel Muzio, Joseph Broschak, and Bob Hinings. Published by Oxford University Press, it marks the coming of age of Professional Service Firms (PSF) scholarship. The Handbook brings together leading scholars in the field and offers many potentially important insights into these organisations and their significance within the knowledge economy. It also suggests new lines of inquiry that may shed further light on the activities and performance of PSFs and the professionals who work within them.